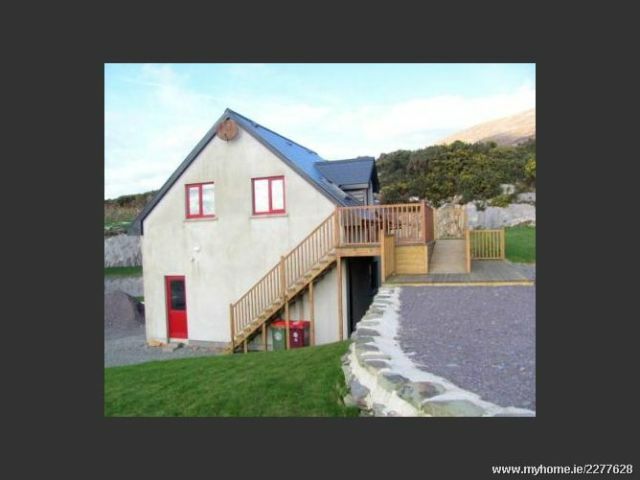 If you are looking to escape form it all and feel closer to nature than this two double bedroom apartment on the Sheeps Head Peninsula which is a peaceful, unspoilt peninsula with some of the most beautiful scenery in all of Ireland would be ideal. Offering spectacular views of Dunmanus Bay stretching into the Atlantic Ocean and situated a short distance from the village of Kilcrohane with its local shops, school and church and a 30 minute drive from the historic town of Bantry. There are tremendous sign posted walks to be had across the rolling countryside. The accommodation itself comprises of one double room and one twin room, open plan kitchen and lounge, bathroom and a utility area at the entrance ideal for leaving those muddy hiking boots. There is oil central heating, washing machine, dishwasher, built in oven, electric hob and microwave. Also double glazed throughout and Velux windows for even greater light. The outside offers a decked patio area great for watching those sunsets and your own private parking area. Cots & Highchairs are available on request. Linen & towels are included in the rate. Check in time is 1.00pm and check out time is 11.00am. From Bantry Town drive towards Skibbereen and pass Barry’s Garage, take the next right for Durrus and Sheeps Head Penninsula. Remain on this for and once you drive in to the village turn right at the sign for Kilcrohane. Stay on this road, drive through the village of Ahakista, carry on you will pass a sign for Farranmanagh on the left pass that and take the very next road Right. Keep to the left at the Y on the road and the house is located immediately on the left hand side.